Thor: Ragnarok is hilarious. But do you know what would have made it even funnier? ‘80s-style flashbacks. 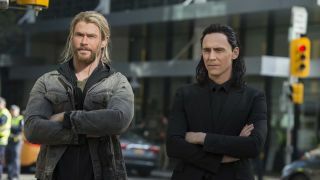 Annoyingly, we were oh-so-close to seeing what surely would have been one of the funniest scenes in MCU history – a flashback involving a rotund Thor and an emo Loki in their own high school movie. Canon-breaking? Sure. Brilliant? Absolutely. Even though the movie has some great non-sequiturs – that play, anyone? – this would have been amazing. After seeing what Waititi pulled off with Sakaar, an ‘80s-style Asgard would’ve been unbelievable. Think San Junipero mixed with Game of Thrones and you’re on the right track. But what about emo Loki? Mwah. Perfection. I hope we get Thor 4 just for that scene, to be perfectly honest. Thor: Ragnarok has just launched in theaters in the US, so what better time to read about the movie’s big cameo scene, as well as 5 questions we had after watching Thor: Ragnarok?